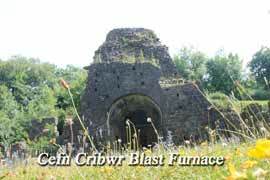 In 1770 an industrialist named John Bedford from Birmingham came to South Wales with a dream of creating the greatest iron works in South Wales, and built a blast furnace in Cefn Criwbr, a small village near the town of Bridgend. The site he purchased was "2 miles in length, and is now known as Bedford Park which occupies 40 acres of land. Apart from the iron works, John also opened up pits to mine for his raw materials (ironstone) for the iron works, and for coal that could also be used to feed the furnaces. 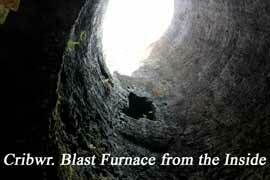 As well as this he created a brickworks and the material was used in the building of much of the iron works. So all in all, Bedford park at the time could be said to be a hive of industrial activity. This provided much work in the area and men would be working for the princely sum of 7/- (7 shillings) a week - that is around 35p, little more than a third of an English Pound (45 cents US), which by even the standards of the 18th century was a pittance. John Bedford didn't fully realize his dreams for his ironworks and he eventually returned to Birmingham where he died in 1791. 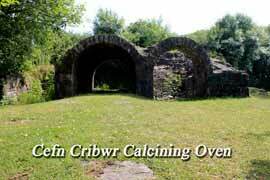 William Bryant was John Bedford's successor and took over business at Cefn Cribwr Ironworks around 1825. Coming from Merthyr Tydfil, the son of a brewer, he had experience working in the Merthyr Iron works and like John Bedford was very optimistic about making Cefn Cribwr a great name to remember in the industrial world of South Wales. William Bryant was said to own some 400 acres where he too, operated mining operations to extract coal and ironstone. To improve transport of his products he built tramways where horses would draw heavily laden wagons along on rails to destination of Porthcawl which unlike the holiday destination it is today was a dockland. This journey would take these horse-drawn wagons around 6 hours to reach their destination, but the addition of the tramway made William even more enthusiastic and very sure of success where John Bedford had failed . But alas, even with addition of his horse-drawn transport, Cefn Cribwr was still doomed and did not live up to William's expectations, probably due to the poor quality of the raw materials he was using. In 1898, William Bryant died at the grand age (for those days) of 85 years never realizing the fulfilment of his dream. 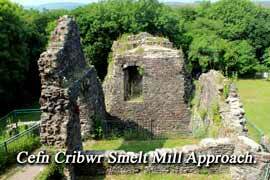 He was buried at Coity, in Bridgend. 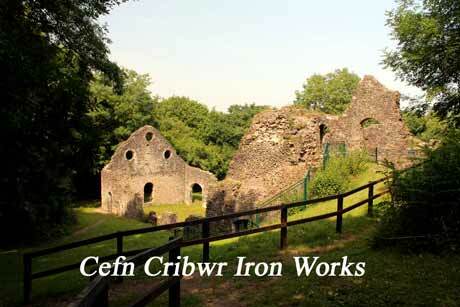 Cefn Cribwr in 1836 and Bedford Park ceased all industrial activity at the end of World War I.
Cefn Cribwr Iron works is a grade II listed building and one of the finest examples of preserved small iron works in the U.K.